This protein-packed and nutritious salad is going to make your guests, delightful and happy. Lightly grilled chicken with a succulent flavor, ripe avocado, juicy strawberries, and a unique salad dressing makes this preparation, unique and irresistible. I've used larger chicken chunks which can be changed to the shredded format if you prefer it that way. Chicken leftovers of this salad can be easily used in a stew or in a gravy-based recipe. Make it fresh just before serving to get the best results. Feel free to slightly change or moderate the dressing ingredients. You can also substitute chicken with your favorite seafood. Let's quickly make this healthy, flavorful, and fulfilling salad preparation in a few easy steps. Do try this nutritious, delicious, and fragment salad preparation made with chicken chunks, fresh avocado, and with loads of fresh and juicy strawberries. Microwave chicken chunks on a high setting for about 3 minutes. Drain the juices (if any) and keep the chunks aside. Grease a nonstick frying pan with a cooking spray and put it on a medium flame. Transfer chicken chunks to the pan. Toss and stir fry for about 3 minutes or until the chunks just start to change the color. In a small bowl, add olive oil, white wine vinegar, lime juice, white pepper powder, and salt. Whip briskly for half a minute to combine everything, well. 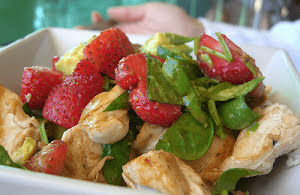 Take a large salad bowl and add avocado, chicken chunks, strawberries, and baby spinach to it. Pour the salad dressing on top. Mix and combine everything gently with a wooden spatula.